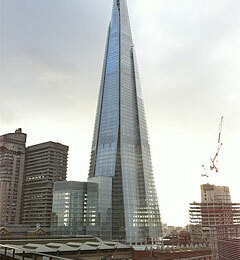 The Shard in London - the tallest building in Western Europe. Address: 32 Joiner Street, Soutwark. At London Bridge on the south side of the River Thames. 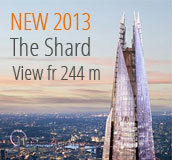 If you like tall buildings, please visit the skyscraper "The Shard". The building is about 310 meters and has three different view points and of course there is an outdoor deck on floor 72 with an absolutely stunning view over the city of London. The skyscraper was inaugurated in the summer of 2012 and was then the tallest building in Western Europe. The Shard is built on the site where the "Southwark Towers" previously stood. It was a building of approximately 100 meters. The architect is the Italian Renzo Piano. The design is inspired by the thoughts of railroad tracks that goes outside the building and the spire brings to mind the mast of a ship. The building consists of glass on the outside that vary in different colors depending on the weather. Construction began in March 2009 and was completed about 3 years later. The building houses a shop, a restaurant and some offices and three different observation decks. One at level 68, at level 69 you can see out across London with a 360 ° panoramic view and on level 72 you can go out on their open air deck and get a stunning view of London. 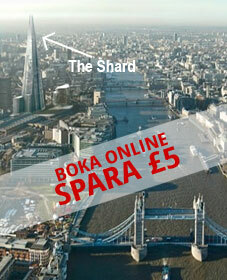 To get an absolutely stunning view of London city, buy tickets to the skyscraper The Shard. If you buy online, it provides you to jump the queue and £ 5 cheaper than when you buy on the spot. The ticket gives you access to the three observation decks. You take the elevator to floor 33 where you change the lift that takes you to level 68, where the store "The Sky Botique" is located. On floor 69, you have a deck with 360 degree panoramic view. Then you can take the stairs up to floor 72 where there is an outdoor deck. With this combi ticket you can visit the Shard on both the day (between 10am-6pm) and return on the night the same day to see London in full light. Booking info: When booking tickets for The Shard, you must specify the day you want to visit and what time of day (morning, afternoon or evening). The last tickets for the day are sold until 20.30 in the evening. The ticket will be sent to your email. Bring the ticket voucher along with photo ID. 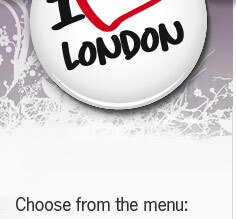 You save £ 5 when you buy your tickets online - be aware that it may be fully booked if you do not pre-book. Please don´t bring any large bags. Once inside you can stay as long as you want, though, they close at 22.